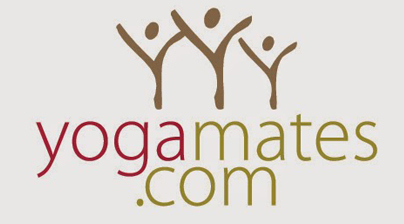 It’s an honor to be interviewed by the fun people at yogamates! YM: When and how did yoga find you? JH: I was studying at the American Conservatory Theatre in San Francisco. We had classes in ballet, theatre movement, dance and one with Beatrice Briggs in yoga. Yoga was my salvation from the insecurity I felt as a young person pursuing acting. I bought her cassette tape and did yoga on my own and took classes wherever I lived from then on. That was 1985. YM: What is ParaYoga and how has it impacted your life? JH: Para means “supreme, highest, ultimate, the utmost reach or fullest extent” in Sanskrit. It is dedicated to a “supreme” way of practicing and sharing the wisdom and light on yoga. Aligned with a living Tantric lineage of Sri Vidya from the Himalayan Mountains and the guidance of Swami Rama, this type of practice focuses on six elements: Dharma (your soul’s destiny), Tantra (self mastery of your mind), Vidya (the science of ancient teachings that have been time-tested over centuries), Agni (Fire, both spiritual and mental), Shri (the ability to see beauty in everything) and Parampara (honoring a living tradition and the Source of the teachings.) Our classes sneak all or most of these elements, sometimes when students aren’t even looking. YM: How did Rod Stryker and ParaYoga change your teaching style? JH: My teaching was already leaning towards the soul path of “WHY are we doing this?” because practicing really hard to get into a difficult pose was no longer interesting to me. I would bring in quotes from the Yoga Sutras, the Bhagavad Gita, and bits from stories about yogic saints. But I was lacking an authentic knowledge of the yoga philosophy and I didn’t yet have a steady pranayama and meditation practice. Learning about the Subtle Body from Rod’s training and how it affects the physical form gave me more ammunition for my teaching. My classes are now filled with more than just how to move the muscle to get deeper into a pose. I generally have an intention of where I want to take people energetically; either to calm and ground them or to bring up their spirits or open their hearts or any number of themes. I now use Ayurveda and look at the time of day, the time of the year, bring in weather conditions or the negative media, and other aspects as ingredients to welcome rather than ignore. I am also trained to use the breath intelligently and the breath is a vital partner in my yoga classes. My goal is that by the end of the class, students reach a deeper sense of calm and steadiness, especially on the inside. And in our current times, we all need a longer lasting sense of inner peace. YM: What makes it so unique? JH The main unique aspect is the attention to energy, shakti, that a ParaYoga teacher will cultivate. Most popular yoga is very physical and focuses on exhaling as one huffs and puffs to keep up with a class. While the exercise is certainly fun and I’m the last one to condone it, some of the classes have the potential to leave students drained of energy for they’ve exhaled their Life Force out of themselves.With ParaYoga, it’s about cultivating an inner energy that gives you the power and strength to do the challenging poses while remaining calm. 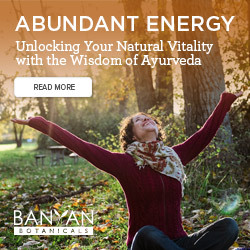 The use of Bandhas (internal locks of energy), Pranayama, Mantra, Mudra and other techniques may be used to access the internal fire and wisely cultivate it to burn your negativity, allowing your radiance to shine. It may still be a physical class, but more of you will be engaged. Since yoga is about union, it makes sense to fully engage the mind, breath and spirit with the movements of the body. YM: How does one get initiated into the Tantric lineage of Sri Vidya and what does this mean? JH: You really don’t know if you want to be initiated until after studying in this style and feeling if your heart longs to be part of the journey. It has to be a longing from the gut, not the mind, which opens to the teachings and the wonderful effects. If this happens, then you approach Yogarupa Stryker and he will meet with you.When one is initiated in this lineage, and one truly does the individual practice given with an open heart, one is now guided by Spirits from the lineage towards healing in the mind, body and soul. It sounds crazy but it’s true. One is guided away from negative habits and positive options are revealed. Your life is still normal on the outside but on the inside, there is a new vibration that intensifies radiantly as your personal practice progresses. YM: Where does ParaYoga show up in your life? JH: Tantra allows me to be practicing true yoga all day long. The practice of Ayurveda is intertwined and affects how and when I eat, practice, sleep, and partake in most activities. I have a meditation practice given to me by Rod and I do that pretty much each day. If I don’t get it in the morning, I will weave it into my whole day. My asana practice happens either before or after my meditation or I slip it in later in the day. My study of the teachings happens as I prepare for workshops or classes set to a particular theme. And because so much of my life is doing, teaching or studying yoga, I make a point to do things that don’t seem yogic to find a balance. Watching the Super Bowl and screaming for Arizona to win until I almost loose my voice is just as Tantric as sitting on my cushion for over an hour prior to the game. Even getting gas for my car is part of my practice – what do I do in that free moment? Mentally complain about life? And if I notice that I’m doing it, I stop it and practice appreciation or bring in my Mantra. All moments are opportunities to feel the Divine in my life. YM: What makes your teaching style stand out? JH: I always have a hard time describing my own teaching because I’m in it, so I will use words I’ve recently heard from my students: People like that I break instructions down clearly so that even in an advanced class, they learn something. Many students also appreciate that I’m not just teaching to the body and ego. I try to open students’ hearts. Most students tell me that they feel much calmer and more at peace after a class, while also feeling quite worked out. Many tell me I am inspiring and introduce them to hope, love and positive perspectives. And some say I’m funny….! YM: What is your favorite part of being a teacher? JH: Humbly, I will acknowledge, that often it is when I teach that I somehow get in alignment with the greatest part of my Self, and with the Divine. The things that come out of me sometimes surprise myself. So I bow with gratitude to the role of teaching for without it and the students who bother to show up, I would not learn as much as I do. YM: What are your personal favorite Yoga resources? JH: My many notebooks from the years of study with Rod are invaluable. For books, I turn to those written by Rod’s teacher, Pandit Rajmani Tigunait, the Yoga Sutras and the Bhagavad Gita, often, throughout a year. For websites I visit Rod’ Stryker’s ParaYoga, Living Tantra, Himalayan Institute, and Sally Kempton. I use CDs from Abraham Hicks and CDs from two of ParaYoga’s trainings to help me stay positive while driving all over Los Angeles. And in life my two cats are my yoga teachers. Sadie was abused, abandoned, feral and so full of hostility that she scared me. Maybelline is the opposite, wanting to love and be loved all day long, never having a negative moment. I want to be like Maybelline and love unconditionally, especially towards the difficult people, for they might soften some as Sadie has begun to do. So living with these two spirits keeps me in check. YM: How do you effectively integrate different styles of yoga into one class? JH: I look for the root essence in all styles and try to speak to that. All forms of good yoga have the same intention: To quiet the mind so that we not only see, but start to BE with our true selves. So while I may mix up my approach, I’ve got the same goal to reach by Savasana. Perhaps because I have such an appreciation and respect for the variety of yoga perspectives, I’m able to bring that enthusiasm into my teaching. Knowing many ways of approaching Trikonasana helps me communicate more effectively to different kinds of people. For me, effectively communicating with others is a spiritual practice. YM: Thank you for joining us! Where can we find out more about you? 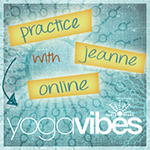 JH: Find me on my website, where my teaching schedule and workshops are listed as well as a few classes to download. And I hope you come introduce yourself to me in one of my classes! Mirror, Mirror on the Wall…Who am I?